Receipts for the month of October aggregated to about Php 31,123.85 Million, almost doubling the earnings in October last year of about Php 16,496.84 Million. The Average Daily Expenditure (ADE) for the month in review is Php 6,862.03. The Average Length of Stay (ALoS) of tourists in the country is recorded at 7.87 nights. 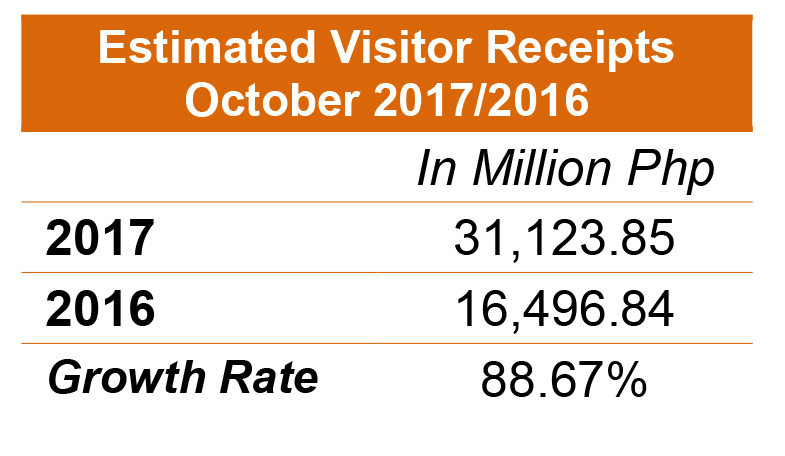 On the other hand, Average per Capita Expenditure of visitors for the month is pegged at Php 54,004.19. China is the top spending market for two months with receipts amounting to about Php 9.95 billion. Visitors from Korea registered an accumulated spending market of about Php 9.00 billion spending. USA placed third with almost Php 2.48 billion spent followed by Taiwan with estimated Php 2.28 billion spending and Japan with Php 1.50 billion. 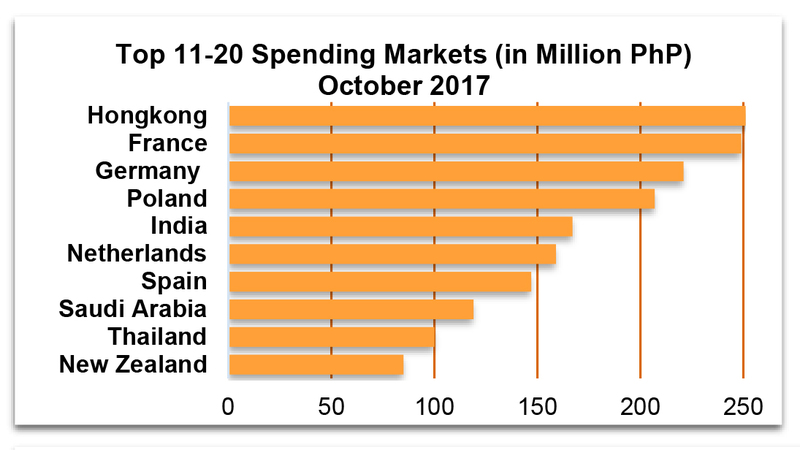 High spending markets Hong Kong, France, Germany and Poland recorded more than 200 Million expenditures in the country. Among the top twenty markets, China registered the highest per capita expenditure for two consecutive months at Php 110,577.80. Taiwan followed with Php 107,413.18 per capita spending. Top market Korea recorded per capita expenditure of Php 64,619.67. Top markets with high per capita spending include France with Php 63,525.13 and Spain with Php 53,371.62. The country welcomed 523,627 tourists for the month of October, showing double-digit growth of 18.19% from the 443,025 arrivals in the same month last year. It is the first time that this month recorded more than 500,000 arrivals. By sub-regional grouping, East Asia supplied the majority of arrivals with a share of 57.13% corresponding to 299,149. This volume increased by 33.99% versus its arrivals of 223,269 for the same month last year. Korea, Japan and China which belong to this region accounted for 51.16% of the total volume. North America provided the second biggest influx of tourists with 81,061 arrivals, constituting 15.48% of the total tourist traffic. The ASEAN region comprised 7.74% share of the total equivalent to 40,512 arrivals. Countries from Asia covered 66.70% of total tourist traffic corresponding to 349,282 visitors. Arrivals from the Americas contributed 15.64% to total inbound volume or 81,872 visitors. On the other hand, 45,265 arrivals (8.65%) came from Europe while some 25,387 arrivals (4.85%) were from Australasia/Pacific. Air arrivals comprised 98.65% of the total inbound visitors, equivalent to 516,583 visitors. A total of 323,597 tourists (61.80%) arrived at Ninoy Aquino International Airport, the primary port of entry of the country. For the major airports in Central Philippines, 94,857 visitors (18.12%) entered through Mactan-Cebu International Airport while 71,037 (13.57%) were received at Kalibo International Airport. Clark International Airport recorded 19,579 of the visitors. Some 4,493 visitors entered through Tagbilaran Airport while the rest of the airports accumulated 3,020 arrivals. Korea, as the country’s top source market, produced 139,218 arrivals for the month in review. Visitor volume from China doubled to 89,932 arrivals from 44,542 arrivals in 2016, posting a growth of 101.90%. On third spot is USA with 67,567 arrivals followed by Japan with 38,733 visitor arrivals. Completing the top 10 markets are Taiwan with 21,241 arrivals, Australia with 19,592 arrivals, Singapore with 13,597 arrivals, Canada with 13,080 arrivals, United Kingdom with 12,695 arrivals and Malaysia with 12,435 arrivals. Visitor count from Hongkong reached 9,226, followed by India with 8,062 arrivals. The top 20 markets this month includes the following: Germany with 5,982 arrivals, Indonesia with 5,073 arrivals, Thailand with 4,530 arrivals, Saudi Arabia with 3,933 arrivals, France with 3,913 arrivals, Guam with 2,912 arrivals, Vietnam with 2,801 arrivals, and Spain with 2,760 arrivals. 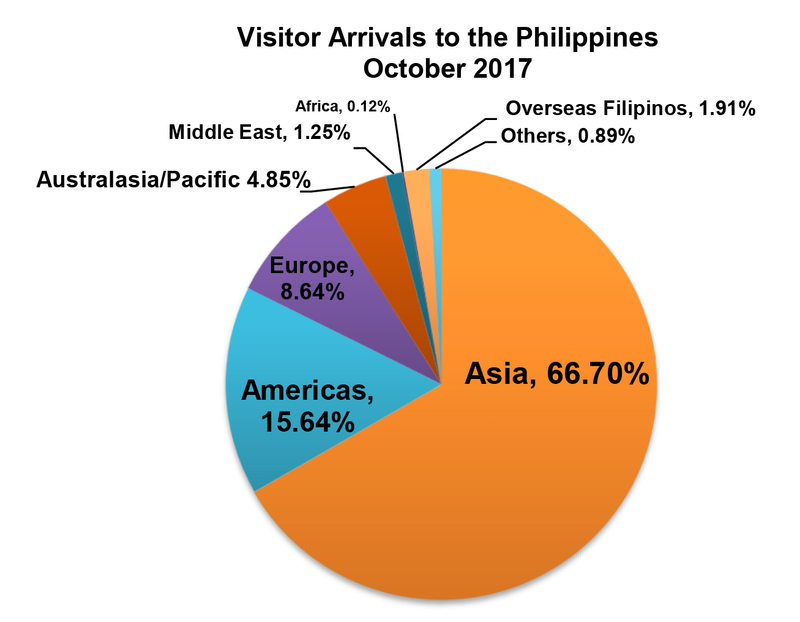 Arrivals to the Philippines have already reached 5,474,310 visitors by the end of October 2017. This volume registered double-digit increase of 11.54% from the 4,908,017 count for the same period last year. The biggest volume was recorded in the month of January while the highest growth was registered in April. 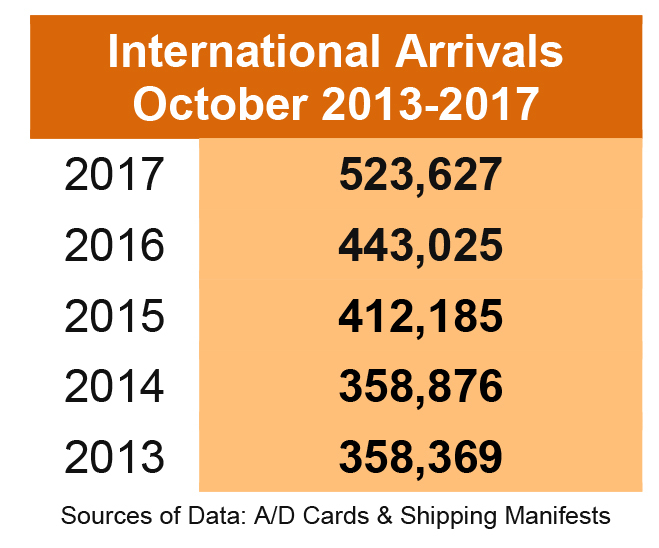 Countries from Asia has already delivered 3,450,612 arrivals, posting a market share of 63.03%. 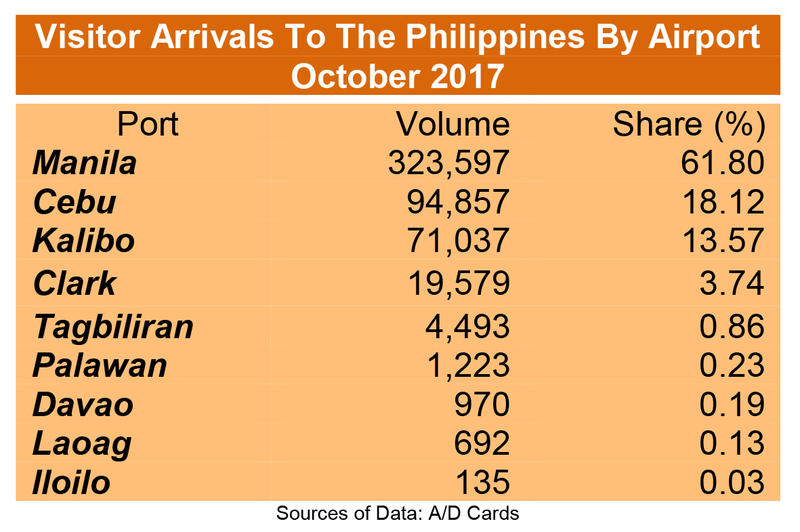 Huge segment came from East Asia with 2,940,148 arrivals (53.71%) while the remaining portions came from the ASEAN with 403,394 arrivals (7.37%) and South Asia with 107,070 arrivals. 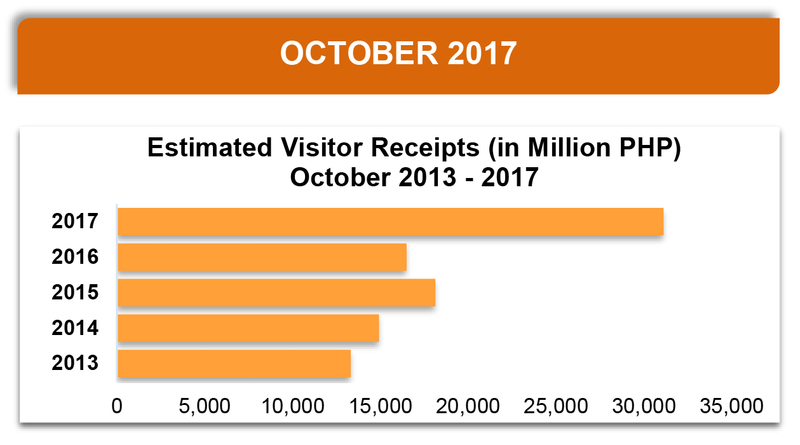 The Americas accumulated a total of 956,490 arrivals, a slice of 17.47% from the total visitor traffic. 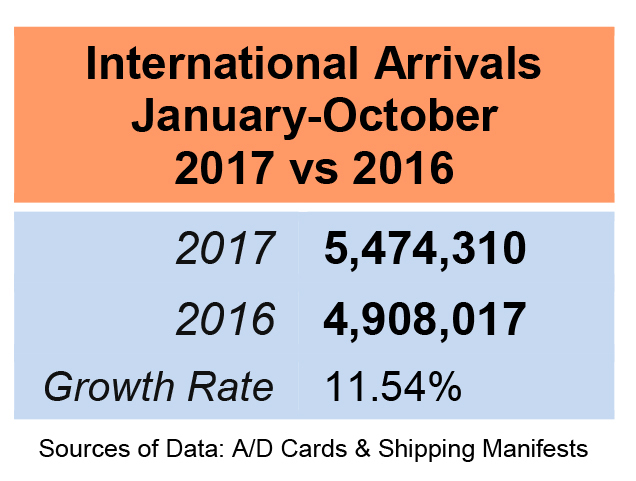 On the other hand, arrivals from Europe reached a total of 547,578 (10.00%) while some 265,690 arrivals (4.85%) were from Australasia/Pacific. Korea, the biggest visitor-generating market for the country, has already reached million arrivals or 1,332,141 visitors, covering 24.33% of the total arrivals. China is the second top source market with an aggregate volume of 810,807 visitors, corresponding to 14.81% of the total. 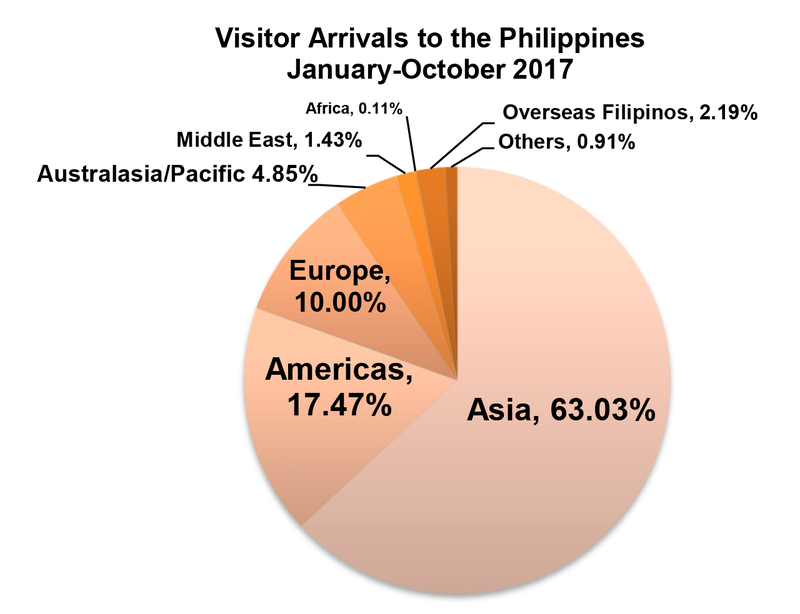 Visitor count from United States of America reached 785,269 arrivals, a share of 14.34%. Japan ranked fourth with 490,857 arrivals, forming 8.97% of the total volume. Australia took the fifth spot by providing 206,443 arrivals followed closely by Taiwan with 205,814 arrivals. Completing the top 10 markets are Canada with 158,225 arrivals, United Kingdom with 148,563 arrivals, Singapore with 139,039 arrivals and Malaysia with 119,155 arrivals. Among the top 10 markets, China posted the highest growth of 39.28%. The top 11-14 markets include Hongkong with 92,902 arrivals, India with 88,832 arrivals, Germany with 70,106 arrivals, and France with 54,051 arrivals. Completing the top 20 sources are Indonesia with 51,570 arrivals, Saudi Arabia with 48,529 arrivals, Thailand with 40,348 arrivals, Viet Nam with 33,281 arrivals, Guam with 30,021 arrivals and Spain with 29,562 arrivals.